My most favorite cookbook hits stores today - Vegan Cookies Invade Your Jar. I was lucky enough to snag a copy early (Thanks, Cosmos Vegan Shoppe), but if you're at all interested in baking, not just vegan baking, you should check this book out. The recipes are, for the most part, super simple, and the finished products are always packing some decadent flavor. It will be holiday party time before you know it, so why not wow your friends (or enemies) with some "I can't believe they're vegan" treats. 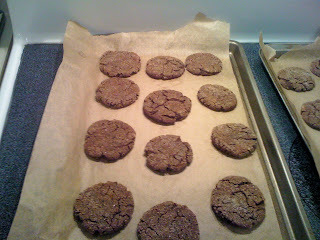 Over the weekend I made the Mexican Chocolate Snicker-doodles, featured in the aforementioned cookie cookbook and also on The Post Punk Kitchen's blog. (See the recipe here.) Chocolate + cinnamon + cayenne pepper? Pretty interesting, actually. I'm a wuss when it comes to spices, so although I appreciate the kick that these little cookies have because of the pepper, I think I may have liked regular old chocolate snicker-doodles better. (As my boyfriend said, "Why don't you just make them without pepper next time. Then they'd be really good." 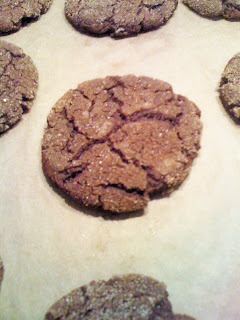 If you're a fan of spiciness, or spices in unexpected places, you might like these cookies more than I did. I thought they were good...but they made me a little hot around the collar. I look forward to trying more of the recipes in this book...there are 100 of them, so it's going to take me awhile to find out which ones will be my favorites! These cookies look great. I think I may have to check out this book! There are SOOO many great recipes in the book. I'm not even a "baker" but the recipes are so simple that I've been able to successfully make a bunch of tasty vegan treats.